I’m going to let you in on a little secret. It’s “Owl” week! 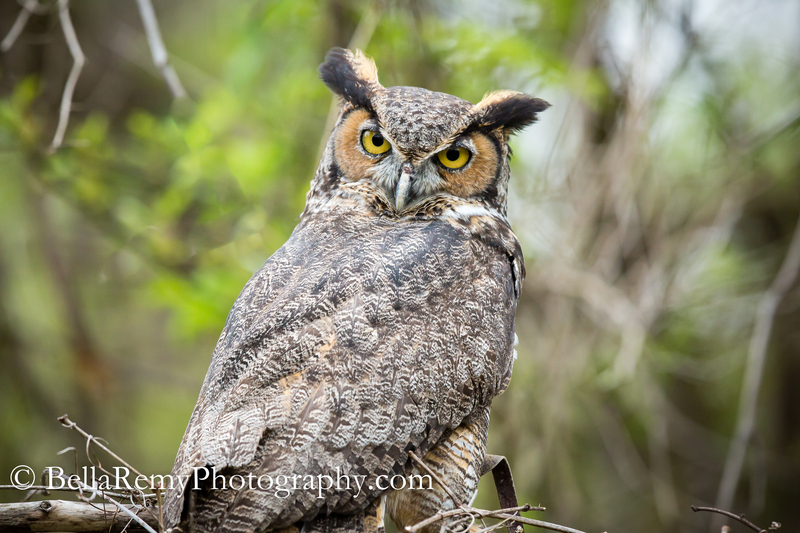 After enjoying the darling little Owlets in Ephrata, Pennsylvania, and the Birds of Prey photography workshop last weekend at Carrie Murray Nature Center I’ve been on owl overload. 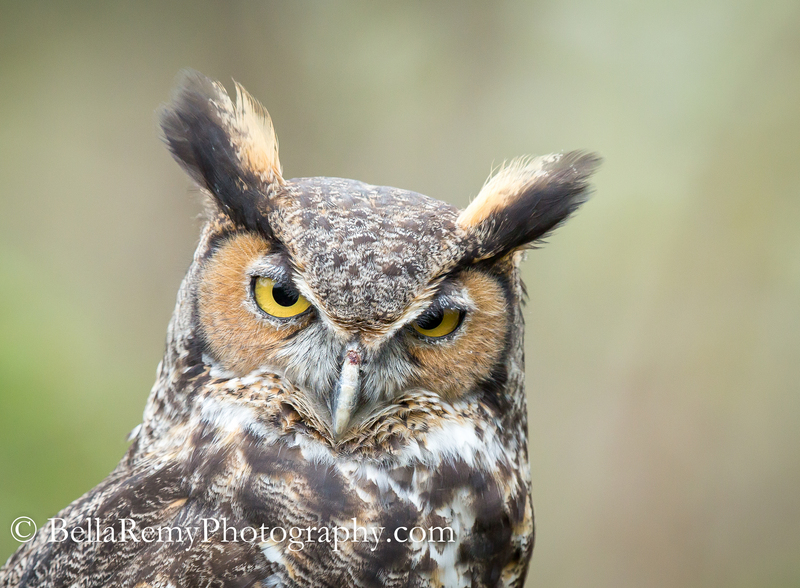 Now that we’ve seen baby Great Horned Owls, it’s now time to enjoy an adult Great Horned Owl. With their bright yellow eyes, and their tufted ears, what’s not to love? Also known as a Hoot Owl, these owls are one of the largest owls in the Americas. These owls have been admired by the Native American for their “strength, courage and beauty,” and the Pima of the Southwest believed them to be reincarnations of slain warriors. A truly beautiful Bird of Prey that I hope one day graces your day. Those eyes, The way they look at you mockingly. Yipes! As if he wanted to eat you…Yipes is right! You and I are really good at getting the plants to attack us. For me – last week on my hike a tree bit me. Keep your eyes open, you never know what you’ll see. What GLORIOUS captures! Owl week? Can we not have an entire month? If only I had enough owls to share Joanne. Although I do have a couple more in my archives. Thank you so much. I love these Plumicorns – don’t you just love that name Fatima? Hugs!! I’ve also been enjoying the owls this year. When I was reading up on the Great Horned Owls, I read that it takes 28 pounds of pressure to release their talons when they are in grip. That’s amazing. Great Horned’s hunt large prey and they use that power and force to break the backs of their larger prey. My goal in the coming weeks is to get a photo of Barn Owls. They’ve been a rather elusive owl for me! I’ve actually had better luck with Snowy’s, believe it or not! That’s incredible Judy that you’ve had better luck with Snowy’s vs. any other. Snowy’s are a fantasy bird for us. Incredible facts on the GH owl, love that you know it and shared it with us. Thanks. I adore owls and have been enjoying all of your owl photos. It has truly been my pleasure to share them with you. Thank you so much. These birds are magnificent! North America is blessed with some really spectacular owls. I hope I get to see some of them over the coming months. Thanks for sharing. I do to David. I hear them more than see them. Thankfully there are places that Carrie Murray Nature Center that allows us to get close and personal with them. A pleasure to share. Thank you. LOL ! Indeed they are Mark. Thank you!